Please see below for latest News items. We are very proud to announce our acceptance as members of the Guild of Master Craftsmen. It is quite an achievement and we have worked hard for the honour. We share the commitment to excellence in our work that members of the Guild are renowned for - and we really hope this membership will help us attract new business too, both locally in Cheshire, Merseyside and Wirral and also further afield in the UK. The emblem and Coat of Arms of the Guild represent skill, integrity, quality and service. 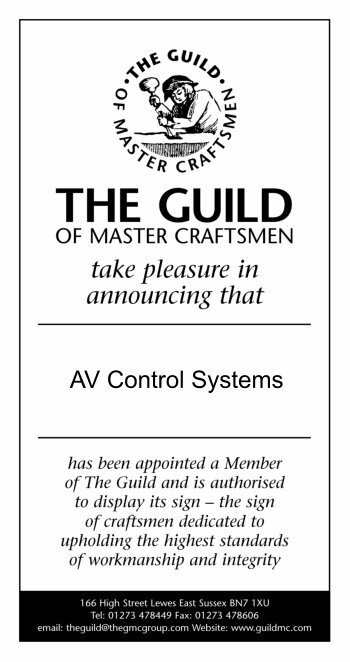 Our membership was granted in recognition of AV Control Systems’ commitment to work with skill and integrity in our field of electrical engineering and designed automation solutions, and our agreement to abide by The Guild’s publicly declared aims and objectives. Importantly, membership follows approval of references submitted by a number of AVCS satisfied customers. AV Control Systems is now entitled to display The Guild logo at our premises, on company vehicles and all of our stationery items. Membership of The Guild of Master Craftsmen offers many benefits to those able to satisfy the selection criteria. These include assistance in marketing skills and techniques, recommendations and advice for managing a growing business and participation in many specially negotiated cost-reduction schemes. The Guild of Master Craftsmen is a national organisation, with members in many different trades, crafts and vocations. It encourages members to strive for excellence and monitors standards to ensure that its principles are being maintained. The Guild has an enviable reputation, earned over many years, for representing quality, craftsmanship, and customer service. With membership comes further assurance for our current and future customers of our commitment to high quality and reliable electrical engineering, design and manufacture services. Customers can check our credentials, with the Guild, which provides a free checking service for customers to validate a “tradesman's” claim to membership.